The park"s area is approximately 17,000 square feet. 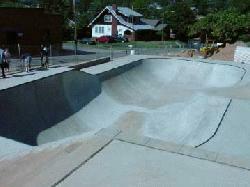 The beginner area consists of a 4-ft bowl with a rolling lip. Within the bowl is a series of hips and a 5-ft. painted curb style-grinding surface. 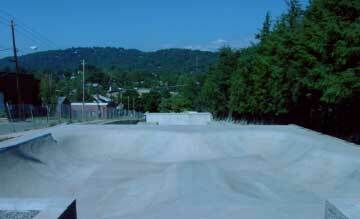 The intermediate section is the largest section consisting of several quarterpipes ranging from 5 ft. to 8 ft. 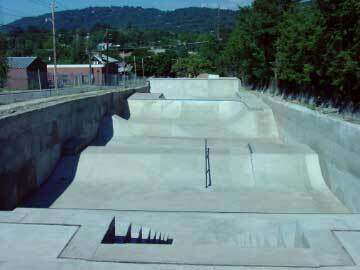 There are several launch boxes, a pyramid, a handrail and ledges. There is also a double-sided bowled out spine, two pump bumps and various other obstacles throughout. The advanced section consists of a 7 to 10 ft. bowl with a hip. The 10-ft. section is a vertical bowl with full metal coping connecting with the 7-ft. section by an escalating grinding surface and a rolling hip. Hours of Operation: Oct. - Mar. : Monday through Friday 2:00 p.m. to dark; Saturday 11:00 a.m. to dark; Sunday 1:00 p.m. to dark. Monday through Friday noon to dark; Saturday 10:00 a.m. to dark; Sunday 1:00 p.m. to dark.